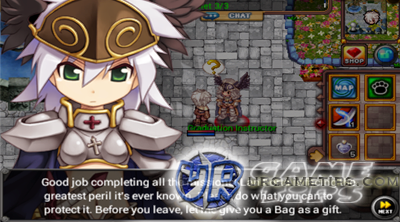 Since Ragnarok: War of Gods offers an excellent in-game tutorial for all game features at the start of the game, I will only highlight here the most used methods or important notes that beginners must learn to play the game easier. Just follow the the tutorials and familiarize yourself with the game mechanics, interface, controls and more. It is also recommended that you play and explore the game first before creating your main character. - Use your Facebook Account to play without limits and to safely save your game. to learn how to control your character, equip weapons and armors, equip consumable items and skills into your quick slots, and more. 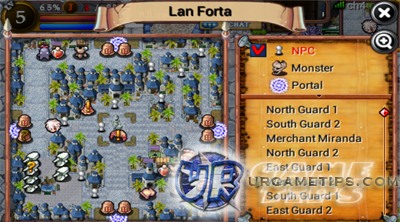 - After this quick tutorial, you will be teleported to Lan Forta! start your Main Tutorial Quests. - Read the quest description then complete the Objective below it. - Quests with Gray colored text = New Quest! - Quests with Green colored text = Not complete or still in progress. - Quests with Gold colored text = Complete and can now redeem rewards. - To access your quests, go to your quest window or select the "Call Quest Menu"
in your quick slot. If you don't have it, go to your Skills window then select the Action option. Set Hotkey for the "Call Quest Menu". This is very useful for tracking your quests! a list of NPCs, Monsters and Portals in your current location. This is also very useful because it will save you a lot of time! on the map (red dots) where you want to go and hunt. - NPCs with (!) = New Available Quest! - NPCs with darkened (?) = Not complete or still in progress. - NPC with bright (?) = Quest Destination, or Complete and can now get rewards. - Use the Mini-Map and remember the above tips to make your game easier! - Continue to explore more Ragnarok: War of Gods game features. - Use the Small Bag: Go to your Items window and use it to expand your inventory. 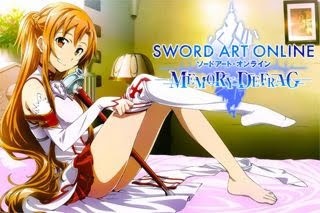 - Equip your Weapon and Armor. - Choose an Active Skill and place it into your Quick Slots. Put your Potions too. get, then use your Mini-Map to help you complete your objectives. - Allocate your Stats: Depends on the character you chose and your play style. - Equip your Pet: Open your inventory and use it. a permanent Peco Peco for 15 Gold Coins (get from quest rewards) from the Event Manager. I highly recommend that you buy this asap to make your travels easier. - Upgrade or Forge your Grade 2 Weapon to +1 to increase Attack/Magic Attack. - Equip a card into your Grade 2 Weapon. - Create a Party with your Friends or Look, Join, Promote Party (optional). - This and the in-game tutorial ends once you talk to the Elder about Job Change. - Perform all Main, Sub, and Repeatable quests for speedy growth. crowded server channels. Go to the System window then select the "Change Channels" option. free items!. Earn and Conserve your Zeny, Rubies and Gold Coins for better items. - Gather items needed for upgrades, crafting and more, do not sell them to NPCs! Cards, Runes or any item that you would like to save for later use. craft items, and more to get better stats. - Ranked from 1 to 5. - Dropped by monsters or buy from Cash Shop. - Grade 2 or above equipments have empty sockets. - Search and Buy Item through the "Auction Machine" NPC. - Receive Payment or Cancel Selling Items, use the "Settle Auction" Item NPC. - Free Message Board, Trade Message Board and Info Message Board. to get powerful equips in the game. They can also be used for a longer period of time than most other items dropped by normal monsters. - Grade 2 (green) or above Equipment can be disassembled into Runes. - Talk to the Elder when you reach Job Level 35 to advance to a new job! - It doesn't stop here, try all upcoming game features that are new to you!